When you wish upon a star...you should wish for this home décor. 1. An ornate mirror that already knows what you're about to ask. Get it from A Love Story Wedding on Etsy for $29.99. 2. Bookends for people who love haunted mansions, but don't necessarily want to live in one. Imported straight from Gracey Manor. Get it from Amazon for $58.03. 3. 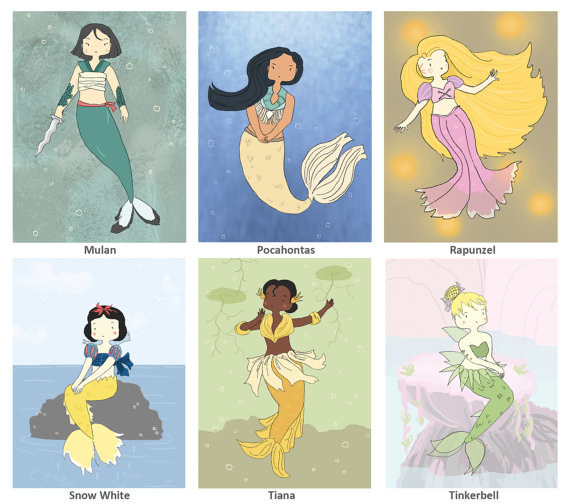 Mini prints that transform Disney heroines into mermaids. 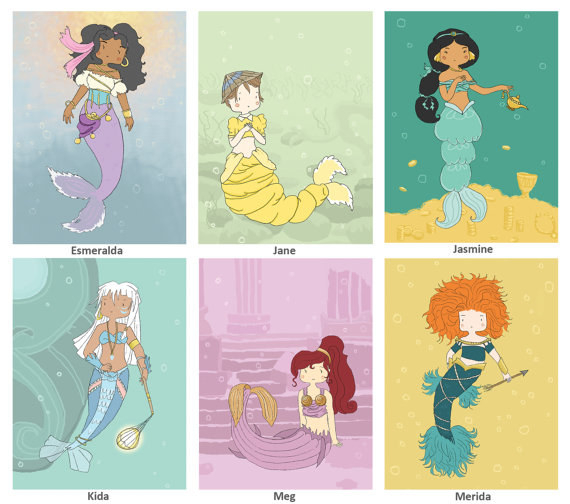 "No Ariel, we want to be a part of your world. The human world is a mess." Get it from Inkling Illustrates on Etsy for $1.25. 4. A Bluetooth speaker that won't turn into a pumpkin at midnight. Warning: This speaker is not responsible for any lost or stolen goods, such as glass slippers. 5. A mini wall calendar that features gorgeous artwork from your favorite movies. Get it from Amazon for $7.49. / Also available in a full-size version on Amazon for $8.99. 6. An enchanted snow globe that will transform your home into a magic castle — certain as the sun. Get it from Box Lunch for $39.92. 7. A wall decal that sums up all the philosophies of Disney. 8. A Mad Hatter mug set that isn't nonsense. For best results, use at tea parties. Have I gone mad? I never want to drink my coffee or tea out of anything else. Get it from Box Lunch for $19.92. 9. A mermaid blanket that will help you feel like you're a part of Ariel's world. Maybe you guys can switch places? 10. Sleeping Beauty and Mulan pillows that'll help you fall asleep faster than you can say, "I pricked my finger on this spindle." ...sleep so good, you wake up transformed into a ~badass~ warrior. Get them from The Art of Orelly and Rousetta on Society6 for $27 (left) and $20 (right). 11. Pillows in the shape of Snow White, Tinker Bell, Rapunzel, and Pocahontas. Get them from The Disney Store for $6.99. 12. An art print that proves there's no place like home. Yes, Disney World is my home. Get it from megghan18 on Society6 for $13.52. 13. A Pixar-inspired slow cooker that will take your meal to infinity and beyond. 14. A poisoned apple spell that is a terrible replacement for your candy apple recipe. Get it from Raggedy Ree on Etsy for $15. 15. A porcelain bowl and saucer set that is a simple bare necessity. Your worries? Forget about 'em. 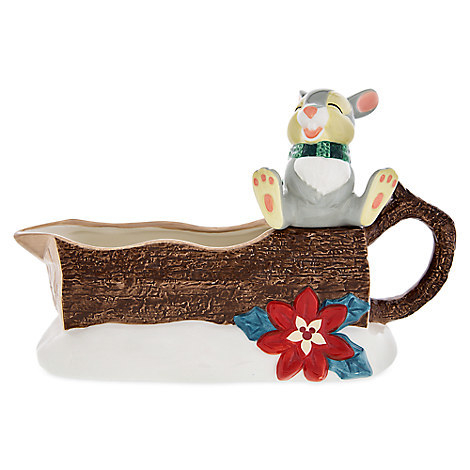 Get it from More Than Porcelain on Etsy for $39.32. 16. A digital print that is basically the décor version of a spoon full of sugar. Get it from Studio Marshall Arts for $5. 17. A banner that was designed by Lumière. Cogsworth complained throughout the whole process. Get it from BBA Homemade for $25. 18. Bambi and Aristocats plates that are excuses to eat dessert all the time, because they're too cute to sit in a cabinet. Get both plates from The Disney Store for $7.95 (left) and $7.95 (right). 19. A scrapbook to chronicle all the adventures you've had with the Ellie to your Carl. 20. A pillow that means no worries, for the rest of your sleeps. Get it from York Des Co on Etsy for $21.95. 21. 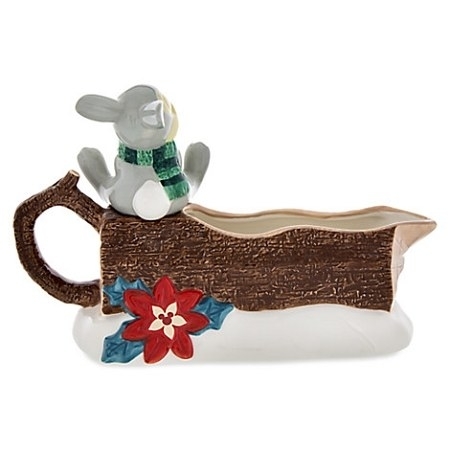 A gravy boat that lets Thumper add some extra happiness to your meal. "If you can't say something nice, don't say anything at all." —me channeling Thumper, when someone says they don't like gravy. Get it from The Disney Store for $26.99. 22. Winnie the Pooh and Frozen light switch and electrical covers that will literally light up your room. Get them from Hippie Mystic Studio on Etsy for $11 (left) and $6 (right). 23. A record that features your favorite artists singing classic Disney songs. Ex: Tori Kelly singing "Colors of the Wind." Get it from Urban Outfitters for $21.98. 24. A light-up Lumière that provides a night-light for your guests. Or just yourself. Don't believe him? Ask the dishes. Get it from Amazon for $81.97. 25. A tapestry throw that will transform your room into a whole new world. How do I feel about redecorating? I have indescribable feelings. 26. A rug that depicts the best scene of The Lion King. Hands down. When you see Simba transform from a youngin' to an adult? Omg. Get it from Brietron Art on Society6 for $28. 27. A Peter Pan candle that gives you directions, and an Alice in Wonderland one that smells like a tea party. Get both from In the Wick of Time on Etsy for $16.50 (left) and $16.50 (right). 28. A puzzle of your favorite Disney villains that, upon completion, should be framed. Provided you don't lose any pieces in the process. 29. Harris, Huber, and Hamish ornaments that only very Brave people can put on their tree. These are, after all, the scariest bears around. Get them from The Disney Store for $16.99. 30. An art print that reminds you to look Up when times are really tough. Get it from Hello Miss May on Etsy for $7.50.